It's a jungle out there and everyone needs a little help surviving sometimes. Our Snack Survival gift can is filled to the brim with inviting treats like Oreo cookies, Reese's Pieces candies, M and M candies, Famous Amos cookies and more. 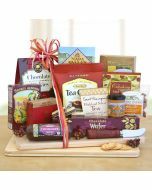 A great gift for Birthdays, get well or just thinking of you.